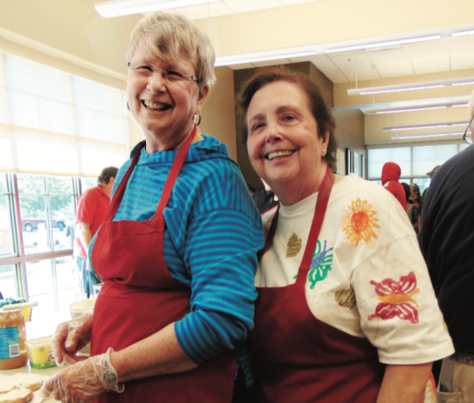 As a nonprofit organization, St. John’s Food for the Poor Program soup kitchen and food pantry rely on the assistance of community volunteers to help feed 450-700 hot nutritious meals every weekday morning. Volunteers are critical to the functioning of our programs. We welcome you to join us and help out! Business and groups can volunteer together — volunteering is a perfect team building experience: it unites the group and coordinates group strengths, while giving the group a sense of satisfaction, self-esteem and accomplishment, to know that together and individually they have contributed to fight hunger and help our community. 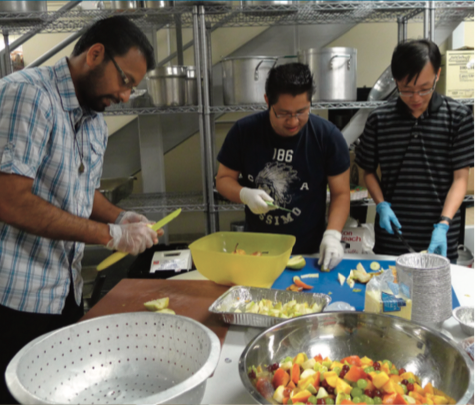 New volunteers are invited to participate in an orientation to learn more about the St. John’s Food for the Poor Program and our many volunteer opportunities. 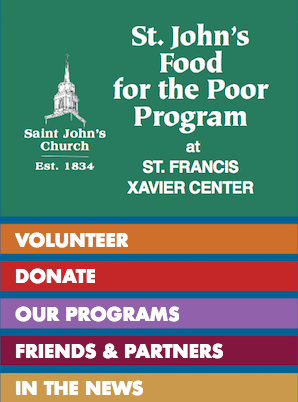 To volunteer, sign up for a date using our Sign Up Genius Page, email info@stjohnsfoodforthepoor.org or contact St. John’s Food for the Poor Program at our St. Francis Xavier Center. We need your help! 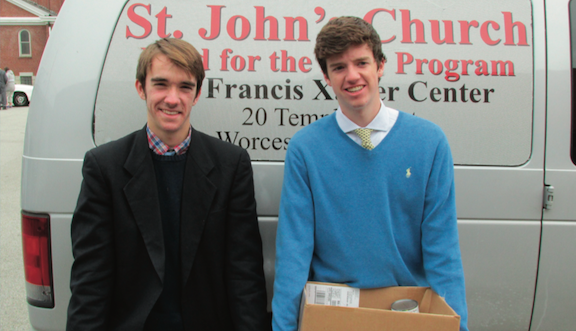 A food drive provides much needed food for St. John’s Food for the Poor Program. A food drive can be organized by an individual, family, church, school or business. It is easy and fun to coordinate. A food drive promotes hunger awareness while helping those in need. To assist you in organizing a food drive, we have created a downloadable Food Drive Organization Kit. 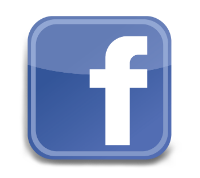 Or contact us to mail information to you. There is always a great deal of fun filling the boxes of food and passing out this much-needed food that you know will help feed a poor and hungry family. 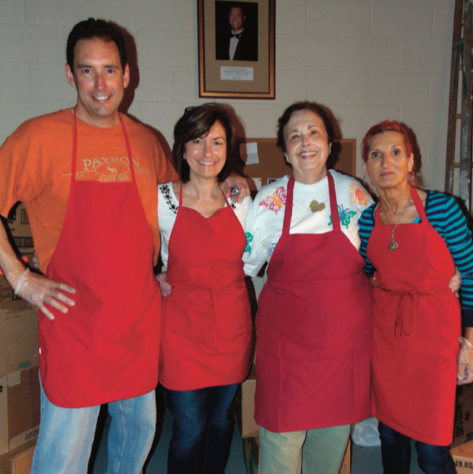 Annually, over 10,500 boxes of food are distributed to families in need. Using modern dishwashing equipment and deep sinks, help clean dishes, pots and pans, serving trays, utensils, glasses and equipment in the kitchen area. Work as a team with others who will dry or put away dishes and other equipment. Help maintain kitchen and surrounding areas. The chef and the soup kitchen manager plan daily menus using a selection of fresh and nutritious ingredients that vary from day to day. Chef and cooks prepare food using a full range of cooking and baking methods. Assist the cook in the preparation of the meals. Arrive at a set time several hours prior to meal time. Assist the cook and servers to ensure a smooth uninterrupted flow of food from the kitchen to the cook or directly to the food servers. Duties may include: receiving or retrieving food and food ingredients from the freezer, or storage places, retrieving and organizing cooking utensils and food preparation equipment, cutting, carving, chopping, seasoning, and preparing food for cooking, assisting in constant clean up and organization of the cooking areas and keeping the kitchen uncluttered and safe. Under the supervision of the kitchen supervisor fill the individual plates according to what the guests want. In addition to serving food you may be asked to ladle soups and sauces or fill beverage containers. Help celebrate a guest by giving him, her or a child birthday cake and ice cream. You will see a smile from cheek to cheek and sometimes receive a simple “Thank you” with a tear. After meals, assist food servers in cleaning up the dining room so that it will be clean and ready for the next day’s meal service. 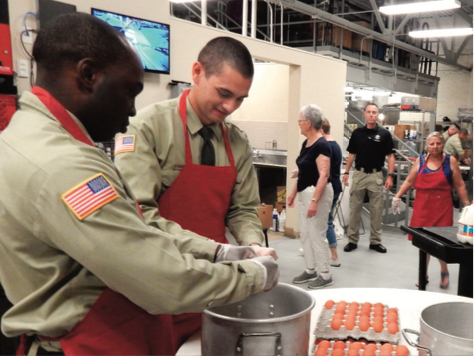 Activities will include removing items from tables, sanitizing tables and chairs, picking up and emptying trash, sanitizing carts and trays and taking them into the kitchen for storage, and sweeping and mopping dining room floors. Students from local colleges, high schools, and middle schools are encouraged to help out, individually and in groups. Volunteer your expertise! Business and government executives are encouraged to contribute in- kind: to volunteer their talent for various projects to benefit poor and hungry men, women and children. Pro bono legal, business management, finance, writing, website development, social media, public relations and fundraising experience are needed. 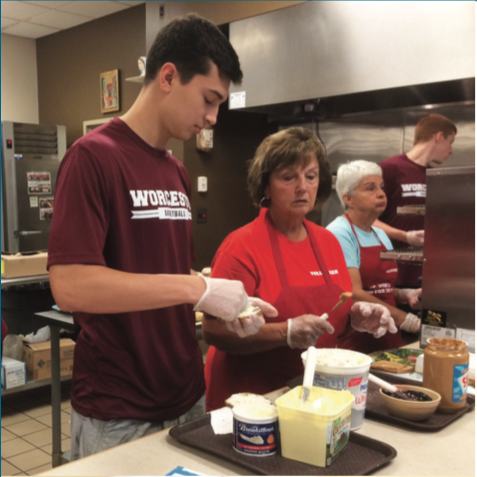 Professional services are vital to the continued existence of the St. John’s Food for the Poor Program, plus volunteering services is a generous way for retired executives to stay busy with work that benefits our entire community. Arrange for timely and professional execution of food donation pickups and deliveries. Work with other volunteers who assist in donor pickups and deliveries. Inspect food donations to assure that safety and sanitation standards are met. Assist in maintaining an orderly and sanitary storage facility. Drivers must have a good driving record and a valid driver’s license. Drivers assist the soup kitchen manager by picking up donations of food, supplies, or equipment. Drivers may need to assist with the loading and unloading of possibly heavy items. The St. John’s Food for the Poor Program relies on our two donated mobile food vans. Our vans pick up donated food and supplies, deliver food to small food pantries, handle emergency deliveries, and ensure milk and other foods are available for children and poor families. The vans must run! 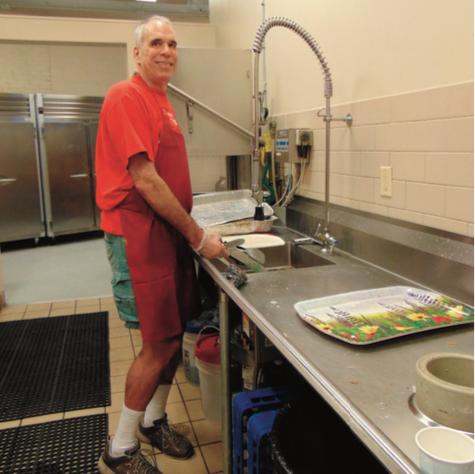 Repair and maintenance bills can drive up cost of running our soup kitchen and food pantry. Provide clerical and administrative support, including correspondence such as letter writing, email, assistance with answering phones and making follow-up phone calls. Proficiency in Microsoft Word, ability to enter data in a database, and familiarity with Facebook, Twitter and social media.